Who Says Safe Food Preparation Is Only For Commercial Restaurants? Safe food preparation is something we all need to practice, whether you are a family member or a restaurantuer! Food poisoning, one of the most widely prevalent illnesses today begins where you prepare your food and the cleanliness of your area. Safe food preparation can prevent food poinsoning. It starts as a slight discomfort within a few hours of eating, and can turn into a life-threatening emergency requiring hospitalization. 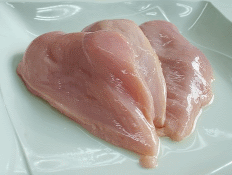 Salmonella e-coli and listeria bacteria are the two most common culprits. While they are easy to ignore, a few common sense precautions can be taken to reduce the likelihood of an up close and personal experience with food poisoning for you and your family. You say, "I'm not a dirty person." Well, you can be a neat-nick and still get sick. Especially when you eat out! Common breeding grounds for Salmonella e-coli and listeria bacteria are in the kitchen. Dishrags, towels, pastry brushes, cutting boards and kitchen sinks are havens for bacteria. You can also add to the list your cabinet door and drawer handles, your refrigerator handles and any kitchen utensils you may have in the drawer. Utensils in the kitchen that are handled after touching another contaminated one will pass those invisible culprets onto more surfaces, thus making more opportunities for illness. The first thing you should be doing to keep your kitchen safe, is frequent and thorough hand washing. By doing just that small step, will help you stay healthy. Planning your shopping trips so that perishables get home and into the refrigerator as soon as possible. Your refrigerator should be set to 40 degrees, and the freezer to 0 degrees. If you are like most of us with little time for domestic household chores, try not to overfill your refrigerator; the cold air needs to circulate. If you have a refrigerator that cannot support those temperature ranges, replace it or get it serviced. Poultry should be washed in cold water when you bring it home from the supermarket and then refrigerate it immediately. Chris an I put our meats into air-tite bags then remove any excess air with the little kitchen gizmo we have. That also helps prevent freezer burn. Always wash your hands and everything else that comes into contact with raw poultry. This includes kitchen scissors, knives, cutting boards, and towels. Do not reuse any of these items for any other food preparation without washing them first. One way to help prevent cross-contamination is to get a set of color-coded cutting boards. Bed, Bath and Beyond carries them as well as other department chains, and they come in various colors so you can prevent cross-contamination. Green color is for fruits and vegetables. Tan is for fish and seafood. White is for dairy products. Yellow is for raw poultry. Red is for raw meat. Wash all fruits and vegetables when you get them home from the market. This even includes things like bananas. Ever touch an apple or pear and get that oily feeling? Dishrags and towels are one of the biggest breeding grounds for bacteria, so consider using more paper towels, unless you are a tree hugging environmentalist where you might then have another alternative. Always clean your kitchen counters before and after food preparation. Especially if you have tiles! Now, check the labels on condiments, sauces, jams and jellies. Some need refrigeration after opening so don't leave them around on the counter or put them back into the cabinet to hide and breed. Don't ever leave mayonnaise on the counter! This especially applies in warm weather. This also applies to anything made with the mayonnaise. Leaving it in direct sunlight when outdoors is when bacteria will do it's best to get you! Wash eggs with ice cold water before putting them in the refridgerator. Huh? Yep, think of where they came from and how many people were involved to get them to the market. Try to use a meat thermometer and make sure that all meat, poultry and fish are cooked to the proper temperature. This will kill dangerous bacteria. Red meat should be brown inside. Chicken should have clear juices when touched with a fork. Fish should fall apart when touched too. Remember, bacteria tend to grow best within a temperature range of 40 to 140 degrees. If you prepare food in advance and then let it cool, it should be reheated to at least 165 degrees. If a can has bulging tops or sides throw it away! Inspect cans and jars for damage before you purchase them. Also avoid jars with loose lids. I once had the opportinity to watch a child break the seal on the lids of jars because he liked to hear the tops pop. Also another safe food preparation habit is to check the "sell by" or "use by" dates. Markets will sell those items at reduced prices, so be aware. While I could go on and on about food safety in and around your home, just be aware and remember to at least wash your hands before, during and after you handle food. When in a restaurant, or getting takeout, you never know who has done what, innocently so be vigilent about your hygene. It only takes one time of getting ill to convince you. Also, "County Fair Season," before you purchase from that vendor, do a quick check of who is doing what with the food, the cleanliness of the preparation area, where the condiments are placed and the overall cleanliness of the food booth. See More Safe Food Preparation Suggestions! Return to Easy Everyday Cooking Recipes from Safe Food Preparation.